Violinist, conductor, composer, and manager; born at Habelschwerdt, Silesia, Aug. 26, 1834; died at New York Nov. 13, 1881. He began his career as a violinist in an orchestra at Breslau, and then made a tour of Australia and Africa with his brother Karl, a pianist of distinction. 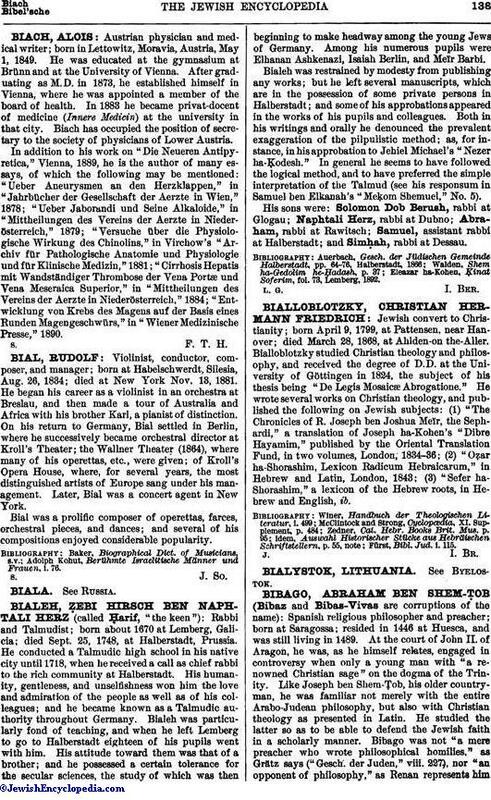 On his return to Germany, Bial settled in Berlin, where he successively became orchestral director at Kroll's Theater; the Wallner Theater (1864), where many of his operettas, etc., were given; of Kroll's Opera House, where, for several years, the most distinguished artists of Europe sang under his management. Later, Bial was a concert agent in New York. Bial was a prolific composer of operettas, farces, orchestral pieces, and dances; and several of his compositions enjoyed considerable popularity. Adolph Kohut, Berühmte Israelitische Männer und Frauen, i. 76.